Open the Pillsbury® pizza dough as per the instructions. Spread out over a nonstick rectangular baking sheet. Using a cooking brush spread the olive oil over the dough and sprinkle a little bit of ground pepper. Place in the oven and let cook for 8 minutes or until it’s slightly golden brown. Take out of the oven and set aside. You don't want to cook it completely yet since you’ll have to put it back in the oven to melt the cheese. Add 1 tablespoon of olive oil to a saucepan over medium heat. Sauté the onions and peppers for 3 minutes. Add the chorizo and cook for 5-8 minutes or until the chorizo browns. Pour the mixture on to a paper towel to soak up any excess oil. Mix the eggs and milk in a bowl. Salt and pepper to taste. Add another tablespoon of olive oil to a medium-sized saucepan. Cook the eggs and stir constantly for 5 minutes. The eggs should still be a little undercooked since they’re going in the oven. Remove from the stove and set aside. Sprinkle some cheddar cheese over the cooked pizza crust and then evenly distribute the eggs. Add the chorizo mix and the rest of the cheese. Top it all off with a little parmesan cheese. Put back in the oven for another 5 minutes or until the cheese is melted. Serve hot. You can use other toppings like mushrooms or spinach. 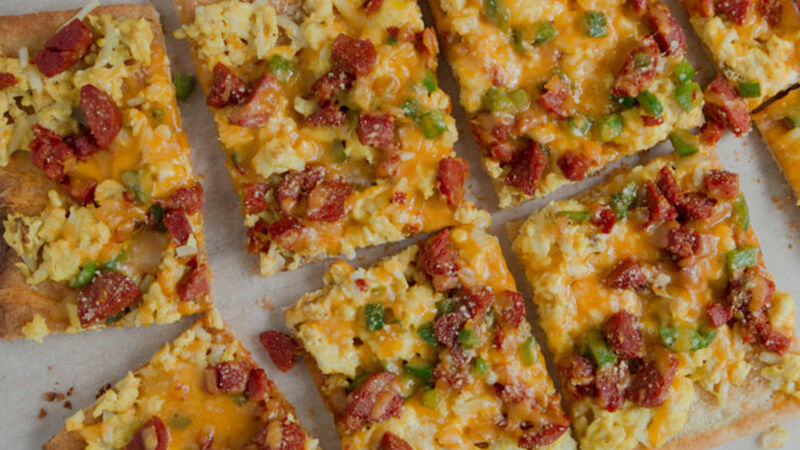 To be completely honest with you, I never heard of this breakfast pizza until a few days ago. My first thought was: “What? Pizza for breakfast… how weird!” But, the truth is that it’s actually really delicious! My entire family loved it so much that they have asked me to make it more often! This recipe is very easy thanks to Pillsbury® Thin Pizza Crust and you can use any ingredients you like. This time I used chorizo to give it a nice spicy kick.